“I fell in love with that water pump the first time I saw it,” said Joshua Okundi, a passion-fruit farmer from Kendu Bay. Okundi (pictured above, center, with blue cap) is one of the 9,000 farmers who saw the solar pump at one of the joint Winrock-Kenya Agricultural Value Chain Enterprises (KAVES) demonstration events in 2015 and expressed an interest in purchasing it. Only nine of those farmers were able to pay cash up front, though — the pump sells for $650 — and Okundi wasn’t one of them. Like most farmers, he needed a loan to purchase the pump, and at that time only one bank, Equity, was lending. Farmer after farmer told us they wanted the pump but no bank would give them credit. 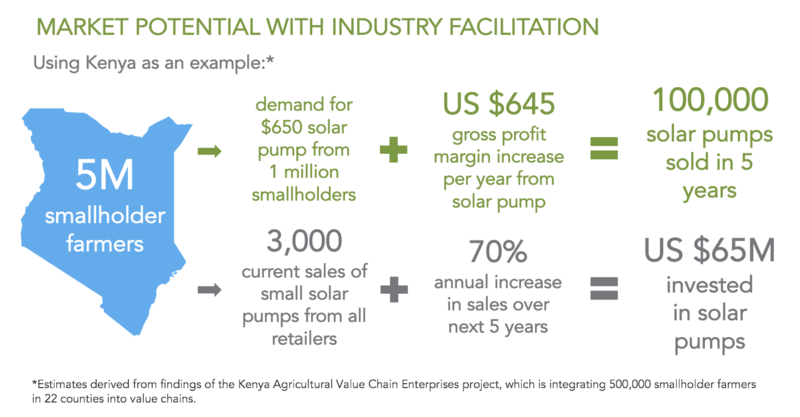 For over a year, we had been working through the Kenya Smallholder Solar Irrigation Project (KSSI) to commercialize solar water pumps (SWPs) in Kenya, testing and vetting the technology and demonstrating its many advantages to farmers. However, there was an important piece missing — the financing. So the next year we set out on a mission to expand access to finance and enable smallholders to benefit from this technology. Crafting a list of 20 or so potential partner financial institutions, we hit the bustling roads of Nairobi. We quickly learned that agricultural lending conditions were not exactly farmer-friendly: some demanded credit and crop insurance, adding to the already high interest costs of 25 to 30 percent for the pump. The biggest hurdle for farmers was the hefty collateral ask, requiring them to pledge land or property. What kept our spirits high was seeing how the pumps could help diversify agricultural loans for the banks. “This market is like an ocean,” said one CFO, describing his eagerness to enter it. A bank’s biggest headache in lending to agriculture is the default risk caused by rainfall variability and drought. That’s precisely the solution SWPs offered. To circumvent the collateral issue, we partnered with two financial institutions that lent to groups instead of individual farmers. Farmers co-guaranteed each other and pledged soft collateral (a cow) against the loan. Financial institutions remained reluctant to include pumps as collateral because they lacked a stamp of approval from a recognized quality standard certification program. However, Winrock’s technical experts had been testing these pumps on live demo farms and verifying them into the program. This unbiased positioning assured the financial institutions of the basic quality standards of the pump, and they finally agreed to include pumps as part of the collateral. Our next task was to train financial institution personnel on the new technology and support the development of a new credit product. Data analysis from our farm sites revealed that the pumps can be comfortably repaid within two years by increasing crop yields and decreasing diesel use. We also served as a bridge for the SWP suppliers, advising them on how to approach financial institutions, helping to structure distribution and after-sale service provisions, negotiating volumes and price discounts. In a span of only three months, we successfully closed three tripartite MOUs and developed three new credit products. Since then, almost 50 farmers have either received loans or are saving for a down payment to borrow in the near future. 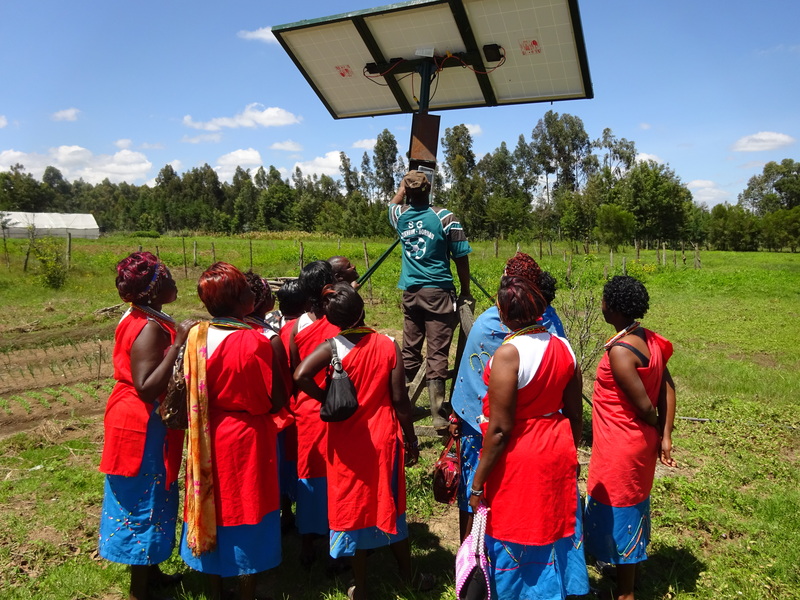 The Norololo women’s group at a solar pump training session at the Nyahururu demo plot. The strong need for an intermediary. Without an intermediary connecting a technology provider and a financial institution, it would have taken much longer for these partnerships to come together. No one-size-fits all solutions. 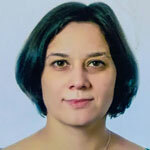 In fact, the right match between technology, topology and a particular branch of the financial institution is critical. Be sure the pump matches the topology and water depth of the pilot site, and that it’s priced appropriately for that branch’s clients. The importance of bundled solutions. Think of the entire infrastructure when developing a credit product — from the pump and the water tank to pipes and drip irrigation lines. Pricing variety. Consider introducing a variety of solar water pumps across different pricing points to give farmers a choice. Ours ranged from $650 to $2,000. Patience. A group lending structure does bypass the collateral issue, but the mechanism still takes a while to provide credit for farmers. What does the future hold? Our next step is to take our work to scale by engaging with bigger entities — cooperatives, import-export aggregators and wholesale buyers. By connecting the dots between technology, finance and aggregation, we hope to place solar water pumps into the hands of thousands of farmers like Okundi.